I’m unpacked. I’m showered. My stuff is put away. I’m in the Blue Room. 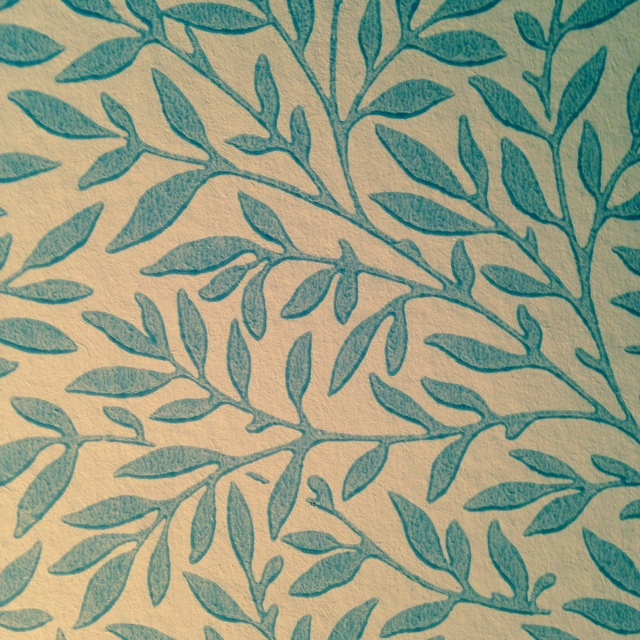 Blue fern papered walls. A generous single bed – is it a TWIN? does that MEAN something? – with a chenille bedspread, white flowers proud of the pale blue background. I can hear a man’s voice, across the hall or downstairs, on the phone or having a live conversation with someone whose voice is too soft to hear. I’ve already hunted for how to turn off the startup chime on my Mac because the handbook says not to talk on your cell phone in your room, in respect or I guess out of respect for the other guests. I’ve learned I’d have to buy an app or use some free Japanese app that I don’t really trust. I don’t trust free. My desk is in a wide, shallow alcove filled with windows. I have a beautiful view of the prairie, and the amphitheater, if that’s what it’s called, an open white proscenium structure in the middle of a clearing. I have a desk with a thick leather deskpad, at the top of which is a wooden pen rest. I’ve set a pen in it. The desk has a rolling task chair with lumbar support, the only modern-looking thing in this room. And probably the only thing I wouldn’t have chosen, because it’s not “charming” like everything else. But as soon as I sat down to look up silencing my chime I was grateful to whoever put it here. It has become charming due to its comfort and wheels. It is blue. There’s a French door leading to a screened porch, with a couple of wicker chairs, a writing table, and a chaise that will be perfect for naps if it gets warm enough. I share it with someone in another room, but there’s a wooden screen in the middle, so we can each have our own half-porch. There’s a mission-style rocker and a mission-style easy chair. There are built-in bookcases, painted white like the trim. On most of the shelves are half-lengths of books. Poetry and novels and reference. The Dictionary of Symbols. Spain. To these, I’ve added four binders of works in progress, some random journals from the past few years, where I hope to find ideas if I run out, and my diary from 1974. Also an old translation of the Rubaiyat of Omar Khayyam that was my dad’s. Also there’s a perfect little bathroom with a huge pedestal sink and a glass shower stall. Also, a roomy closet with lots of extra hooks. A dresser, of course. A nightstand, of course. A couple of framed prints that you’ll be glad to know I’ve straightened. Dave drove me here this afternoon, with Django in tow. The idea was to drop off my stuff and then walk through the prairie. But when we got to the prairie entrance, there was a sign: “Closed until May 2.” Something about plants needing to grow and mud. So we walked back to the car and they went home. I found out later, at the orientation, that we are allowed to walk there if we are careful not to don’t disturb the plants. Maybe they’ll come back.